The most fascinating excursion is the one to the top (3.300 meters). When it is possible to do it (which from April to October means ‘always’ except when there is bad weather or some restriction related to explosive activity) you should’nt miss it. If you don’t have enough time or you don’t feel ready for a long (but easy) trekking tour you will find lighter excursions and even possibility to just take cable car for a brief panoramic tour. 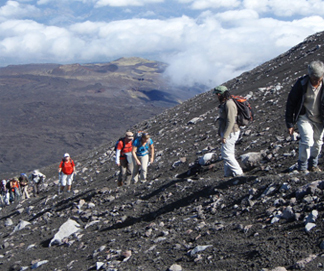 Many of our guests have been lucky taking a trekking tour and suddendly assist to an eruptive event. We are glad to receive (and publish, if authorized) your photos on our webiste. Important note: it is forbidden to pass 3.000 meters without an authorized guide. We are not responsible for these excursions, they are not organized by hotel. They don’t need reservation (nor is possible to reserve) and according to weather they are organized every day. Our hotel guests will get a big discount on cable car’s and 4×4 excursions to Etna organized by “Funivia dell’Etna S.p.a.”! The Hotel Corsaro registered guests will obtain their “Hotel Corsaro Special Guests” card at the check in.